Most people associate the core with the look of your abdominals. They believe that having a strong core is associated with the look of a washboard stomach or Six Pack Abs. In reality, there are 27 muscles that make up the core of your body. From pelvis and hip muscles on up, the core is an entire system. Only a few of the muscles are visible to the naked eye. Core Strength is the foundation of a strong body. It is a major player in balance and injury prevention. Real core strength though is more than just the musculature and bones, ligaments, tendons, and joints that make up the physical system. Building real Core Strength comes from deep within. It is a foundational power and resilience that can only be fully recognized at times of hardship where we dig deep into our core and draw forth the power and strength that is usually buried inside of us. Some people call this internal fortitude. I just look at it as soul strength. This article is simply to give you some practical ways of activating the physical while taking a look at the deeper sides of core strength. Here are my Basic 4 Steps to Building your Powerful Core Strength. Posture: Simply holding your body upright is one of the most difficult things for people to do. We are a forward society and, as such, we are always leaning forward. When we walk, when we are at the computer, and even when we exercise, we tend to hunch our backs. The results of this failure to maintain an upright posture become evident as we grow older and begin to see our feet and the sidewalk more and more. It is also apparent in the amount of low back pain reported in our society. To start to engage the core muscles, hold your body upright. Whether you are standing, sitting, walking, or lying down, maintaining a proper postural position will work your core muscles while constantly creating a flex that helps to store that position in your muscle cell memory. Make sure your toes and feet are parallel, knees are positioned over your ankles, and hips are square. There is no need to raise your shoulders up holding them tight in a military-esque stiff position; instead, let them loose and back while keeping your neck raised and away from your shoulders. Avoid the hunchback position at all opportunities. Not only will this help with your Core Strength, it will also support your body from feet to low back and neck helping to alleviate most chronic body pains. Breathing and Meditation: While sitting upright, holding that good posture we spoke about above, and intentionally breathing may sound basic and lack the pizzazz of a thousand sit ups, it is one of the best ways to build true inner and outer core strength. As you breathe deep into your diaphragm, you begin to challenge core muscles. Breathe in 4-7 seconds; hold 4-7 seconds; breathe out 7-9 seconds. How many can you do and for how long? Challenge yourself to at least 15 minutes of this daily. When you get more advanced, you can start to undulate your body from your pelvis through your lungs and all the way up to your shoulders and neck. You can do increased speed breaths as well as longer deeper breaths, that are always focused with intention, in order to work your core muscles lungs, lymphatic system and increase then decrease then increase then decrease your heart rate giving you an even better core and cardiovascular workout. You may begin to feel tingling in your head and throughout your body; this is a result of increased oxygenation to your cells. This is one of the most difficult practices to maintain, but the benefits are incredible. You will be firing all 27 muscles in the core system creating a seriously strong core. This will increase oxygen levels in your blood allowing for better all around performance in whatever activity you choose for exercise, burn calories, use two of the best detox orifices on the human body(nose and mouth), breathe out all kinds of toxins, focus your brain making you more mentally alert and aware of your surroundings, help to decrease the potential for accidents and injury, and increase the strength of your cardiovascular system creating the best all around performance enhancement inner and outer core workout you will ever experience. Body Weight Workouts: These are a little simpler and need less explanation but are foundational exercises for building the strong inner and outer core strength. These workouts are all done with your body as the sole resistance. You are not lifting weights with these exercises although as you get more advanced you may want to include things like ankle weights or wrist weights or even a weight vest. The point in general is that you are not doing free weights or machine exercises. Examples of these types of exercises include dips, pull-ups, chin-ups, pushups, triceps pushups, handstands, acrobatics, pole dancing, mountain climbing and rappelling, yoga, Pilates, and/or my favorite, Multi Directional Resistance Training which you can read about in my article, “Is It Such a Stretch to Become Flexible?”. Share with everyone in the Comments section other exercises that YOU use to work your core using just your body weight. It is an exciting way to work out as the only restrictions are in your mind and the real push is to break your body’s limitations. This is where the INNER core workout meets the OUTER core workout!!! Balance Challenging Exercises: Increase results and turn ANY ordinary exercise into extraordinary core strengthening workouts by challenging your balance. You can do this by balancing on one leg and then switching to the other. 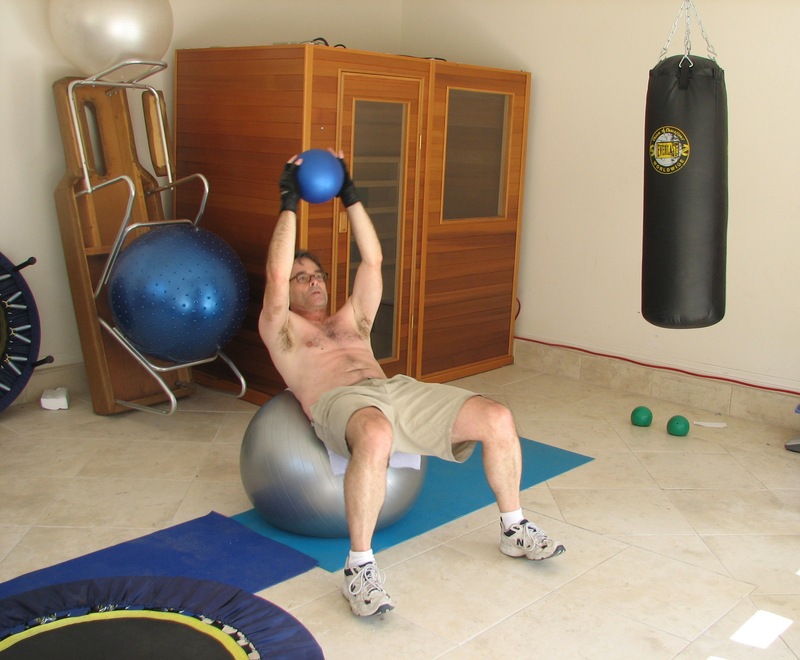 Working out in multiple planes or at multiple angles at the same time challenges the core system. When weightlifting, do so on an uneven surface doing fewer reps at a slow, slow, slow pace. Use balance discs, Bosu balls, stability balls, etc. to challenge all aspects of your equilibrium. When those exercises begin to get easy, you can increase the effectiveness by altering your gaze by looking away from the plane you are working out in or looking directly up at the ceiling while balancing on a balance disc and lifting weights or doing bands at the same time. Eventually closing your eyes will give you the deepest challenge to your equilibrium, and all the balancing and stabilizing muscles in your body working to bring you back to stability will give you the most intense core system strengthening workout you will experience. The inner and outer cores will be challenged as you work through your body shaking and self correcting in micro movements while engaging in deep macro movements. If you are adding that meditative breathing to these exercises and then engage the high quality postural alignment, ALL of your workouts will deliver the foundation thus building the deep inner and outer core strength that we really desire. These kinds of difficult exercises that require patience in our own abilities build character and maintain a quality of your body, mind, and spirit that will be invaluable as you grow older. Practice these Basic 4 Steps to Building your Powerful Core Strength daily and who knows, you may even develop those washboard six pack abs that everyone so desires as well. Share your results with us. We would love to get some feedback on your experience with any or all of this Core Strength Protocol. Have a Blessed Healthy Balanced Day!!! Ari Gronich is highly trained and certified in many disciplines within the fields of bodywork, emotional release, energy work, nutrition, health, and kinesiology and sports therapy. For the last 17 years, he has helped transform his client’s bodies and lives through increased performance, enhancing physical, mental and emotional health. Ari has led ergonomics and productivity seminars, as well as created corporate wellness programs for top companies all across America. He has been a successful business man within the health and fitness field utilizing his unique combination of expertise related to body posture, public speaking and facilitating trainings which gives him the capability of guiding people to create their most powerful presence and taking companies to the next level in productivity and employee benefits. Ari is an “Outside of the Box” thinker and has a way of taking ANY situation and finding the holes that need to be filled thus creating WIN WIN relationships and powerful programs that serve to enhance everyone involved.